Atlantic View, situated in the village of Fenit in County Kerry, which sits on overlooking Tralee Bay, is a wonderful, detached family holiday base. Set solely over the ground floor, the property can sleep eight people in four bedrooms, including two double rooms, one with an en-suite, two twin rooms and a family bathroom. There is also a kitchen with a dining area, a separate dining room and a sitting room with multi-fuel stove and doors leading outside, into the rear, lawned garden. Outside there is off road parking and a front and rear lawned garden with bench. For escaping the hustle and bustle of day-to-day life and exploring this breathtaking region, Atlantic View is the holiday home for you. Overlooking Tralee Bay is the small, pretty seaside village of Fenit, home to some great shops, bars and seafood restaurants and all within easy reach of the long, sandy Banna beach. 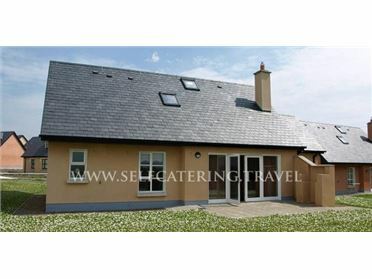 The village itself is conveniently positioned close to the town of Tralee, famous for its wealth of tourist attractions and its incredibly lively social scene with a selection of shops, eateries, pubs and bars. The town of Dingle, with its pristine beaches and water sports, is 30 miles away, whilst the renowned Killarney National Park and the scenic Ring of Kerry are also within easy reach and provide excellent walking and cycling routes. Oil central heating and multi-fuel stove. Electric oven and hob, microwave, fridge, freezer, washer/dryer, dishwasher, TV with basic Sky, DVD, WiFi. Fuel, power and starter pack for stove inc. in rent. Bed linen and towels inc. in rent. Cot and highchair. Ample off road parking. Front and rear lawned garden with bench. Sorry, no pets and no smoking. Shop and pub 1.2 miles.